Originally a racetrack, Hartsfield-Jackson Atlanta International Airport (ATL) is the world's busiest airport, a title it's held since 1998. Averaging more than 275,000 passengers daily and 100 million annually, the airport offers non-stop service to more than 150 domestic and 70 international destinations in more than 50 countries. The airport is the hub of Delta Air Lines, which has nearly 1,000 peak-day departures to over 200 destinations worldwide, including non-stop service from Atlanta to 67 international destinations. In fact, Atlanta is within a two-hour flight to 80 percent of the United States population, making it an ideal hub city. Other domestic carriers, like American, JetBlue and United, have a presence at ATL, as do foreign carriers Air France, British Airways and Virgin Atlantic. The terminal complex, which spans 6.8 million square feet, includes domestic (North and South) and international terminals and concourses T, A, B, C, D, E and F. Detailed terminal maps are available here. 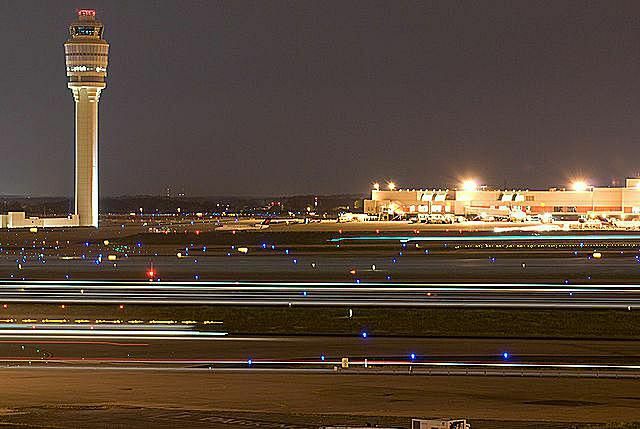 Since ATL can be overwhelming for first time visitors, here's all you need to know about navigating terminals, parking, public transportation, dining and more at the world's busiest airport. ATL has two main terminals: international (east side) and domestic (west side). The domestic terminal is divided into two parts: South Terminal (red) which serves Delta flights, and North Terminal (blue) for all other airlines. The two terminals are united by a central atrium. All airport concourses are accessible via an underground skywalk and plane train, and travel between domestic and international terminals is available via a free shuttle bus. As the world's busiest airport, waits at security checkpoints can reach an hour at peak times. Apply for TSA Pre✓® (must be done in advance) and/or CLEAR (available on the spot) to cut down on wait times, and plan on arriving at least two hours before a domestic flight and three hours before an international one. You can access current security wait times on the ATL website, which also offers Trak-a-Line, a service that updates you via email or text if security times significantly change leading up to your flight. Trak-A-Flight does the same for changes in an airline's flight status. Pro tip: the international terminal security lines usually move faster than those in domestic, and you can reach your domestic departure gates via the plane train or walkway from the international terminal (concourse F) without re-entering security. Hartsfield-Jackson has more than 40,000 parking spaces, so it is possible to find parking on site. However, checking the airport website for the latest on construction projects and road closures as well as the current capacity of parking lots is recommended. There are plenty of nearby off-site parking options as well, including Peachy Airport Parking and Park N' Fly, both of which take reservations and have shuttle service directly to all terminals. The domestic and the international terminals are accessible via Interstates 20, 75, 85 and 285 and are located approximately 20-30 minutes south of downtown Atlanta. Signage is clearly marked coming from all directions, but for detailed directions, check the airport's website. The airport is the last southbound stop on the gold and red lines of MARTA, the city's train system. The train stops between the north and south baggage claims in the domestic terminal, but the free International Airport Terminal shuttle bus is located just outside baggage claim. Taxis are available outside baggage claim at each terminal and charge a flat rate minimum of $30 to and from downtown, with an additional charge of $2/person. Rates to Midtown start at $32, Buckhead $40 and other areas are $2.50 for the first 1/8 mile and $0.25 for each additional 1/8 mile. With over 170 restaurants (tip: here are the 16 best) inside the airport, there's something for every budget, taste and time frame. For peace of mind before entering the daunting security lines at the domestic terminal, the central atrium has a few speedy and casual options like Apple Annie's and IHOP Express. For a sit down meal, try TGI Friday's or Atlanta Chop House & Brewery, which offers local beer (as well as domestic and foreign bottled and on tap), standard American fare and flatscreen TVs so you can catch up on the game while you dine. Searching for lighter, healthier fare? Get grab and go sandwiches, salads and smoothies with a Latin flare from Lottafrutta (Concourse B) or paninis and salads from local chain Fresh to Order (Concourse B). Need something fast, but want to indulge? Two Atlanta institutions--The Varsity (Concourse C), known for its chili dogs, onion rings and Frosted Oranges and Chick-fil-A (Concourses A and C), with its irresistible chicken sandwiches and waffle fries--both have airport outposts. Have time to sit and savor your meal? Head to One Flew South (Concourse E), the airport's first fine dining restaurant, for sushi, craft cocktails and impeccable service. For a quick fix, there's a Starbucks location with the usual sandwiches and snacks, and the Sweet Auburn Curb Market offers paninis, bacon and egg croissants and wholesome hummus platters. Want to dine in and rest before a long flight? Visit Mediterranean spot Ecco for fried goat cheese balls, handmade pastas, pizzas, panini and charcuterie boards or The Original El Taco for Tex-Mex staples like tortilla soup, red chile steak and the “just-crushed” guacamole. Hometown airline Delta has Sky Clubs on every concourse with complimentary beverages, fresh food, free wi-fi and satellite TVs. Access is limited to members, with up to two guests allowed per member at $29/each. There are private showers at select locations. British Airways, Lufthansa, Priority Pass, Lounge Club and Diners Club International passengers have access to the common-use lounge, The Club at ATL, located on Concourse F. Day passes are available for $40. Free wi-fi is available throughout the airport. Once you've selected the airport network, you'll be directed to a splash page to enter your name and email address in order to connect. The airport has ample charging stations at gates in all concourses, so you don't have to worry about running out of juice. Parks: The airport is home to a 1,000-square-foot dog park, Poochie Park, located at the Ground Transportation area on Domestic Terminal South outside of doors W1 and W2. Open 24/7, the park is leash free with grass, a water fountain, biodegradable poop bags and a bench. Tours: Want to get a behind-the-scenes look at the world's busiest airport? Then sign up for tours of the following: airport operations, the airfield, the eTower, the fire station, a history walk through Concourses B and C, the Atlanta SkyTrain and the Aviation Art program. Tours last 1.5 to 3 hours and start at 9 and 10 a.m., and you must sign up at least 21 days before your flight to participate. Aviation Art program: The Aviation Art program, started in 1979 by then-Mayor Maynard Jackson, offers exhibits and performances for passengers and employees. The program commissions artists to create site-specific artwork, presents rotating exhibitions and schedules performing arts series. With over 250 pieces, the collection includes the following works: Zimbabwe: A Tradition in Stone, A Walk Through Atlanta History, Samsonite and Rolling Suitcase and the Quilted Passages tapestry.